A typical design space exploration flow involves an event-based simulator in the loop, often leading to an actual evaluation time that can exceed practical limits for realistic applications. Chip multi-processor architectures further exacerbate this problem given that the actual simulation speed decreases by increasing the number of cores of the chip. Traditional design space exploration lacks of efficient techniques that reduce the number of architectural alternatives to be analyzed. In this chapter, we introduce a set of statistical and machine learning techniques that can be used to predict system level metrics by using closed-form analytical expressions instead of lengthy simulations; the latter are called Response Surface Models (RSM). The principle of RSM is to exploit a set of simulations generated by one or more Design of Experiments strategies to build a surrogate model to predict the system-level metrics. The response model has the same input and output features of the original simulation based model but offers significant speed-up by leveraging analytical, closed-form functions which are tuned during model training. 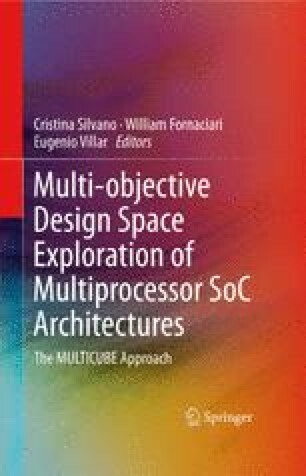 The techniques presented in this chapter can be used to improve the performance of traditional design space exploration algorithms such as those presented in Chap. 3.